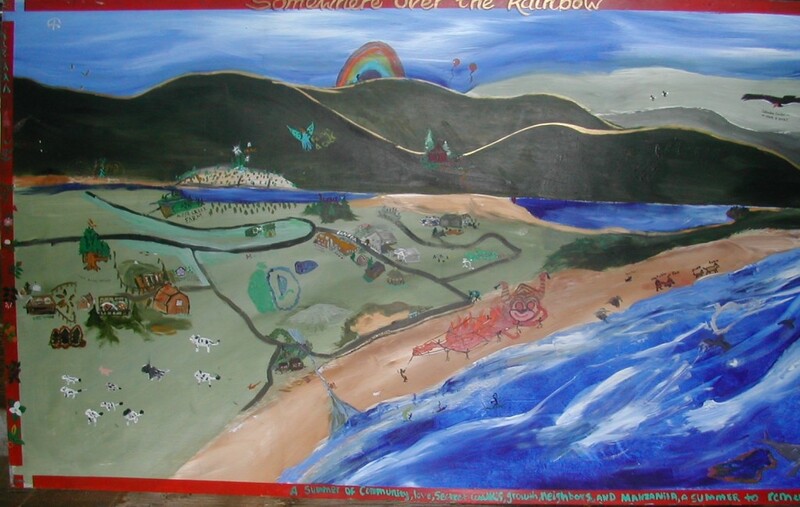 The links on the sidebar of this page are to local organizations I have been directly involved with in the Lower Nehalem River/Neahkahnie Mountain community since moving here full time in 1978. Many other cool things are happening in our area that I intend to eventually link to as I develop this section. There are also incredibly inspiring things happening elsewhere in other communities that show what neighbors can accomplish. Thinking globally and acting locally…. There is land next to CARTM Recycling that I have long been dreaming of as an eco-village combining affordable housing and creative micro-business. 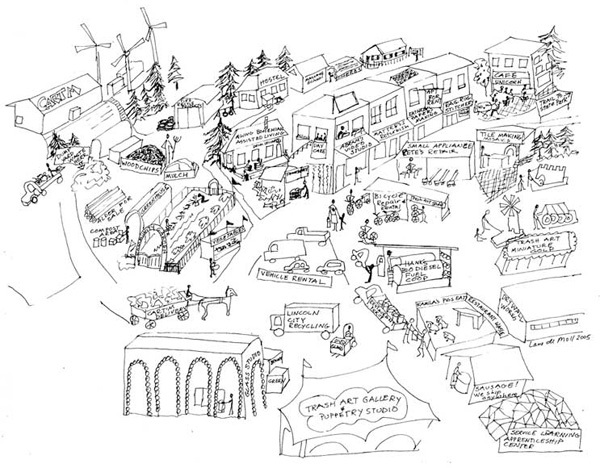 This drawing of mine (circa 2005) was a first crack at manifesting that vision…. Coyote Ridge (aka Nehalem 10th Street) is 10 acres on the edge of Nehalem that could be developed into affordable co-housing (for aging in place?) and/or a healing center. 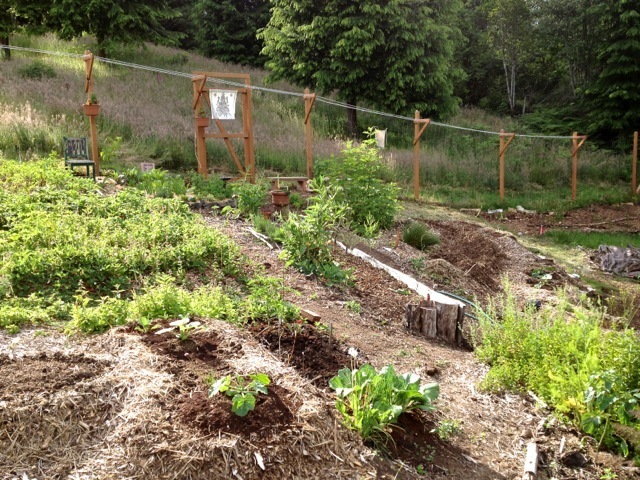 It already includes an active group garden & orchard, plus a small old growth ravine conservation area. Development is just waiting for funding and people who want to take it on. “Elk Ridge” is my fictional description of a one possible scenario…. In 2005 our community received a grant from the Arts Builds Communities program of the Oregon Arts Commission to create a series of vision murals. 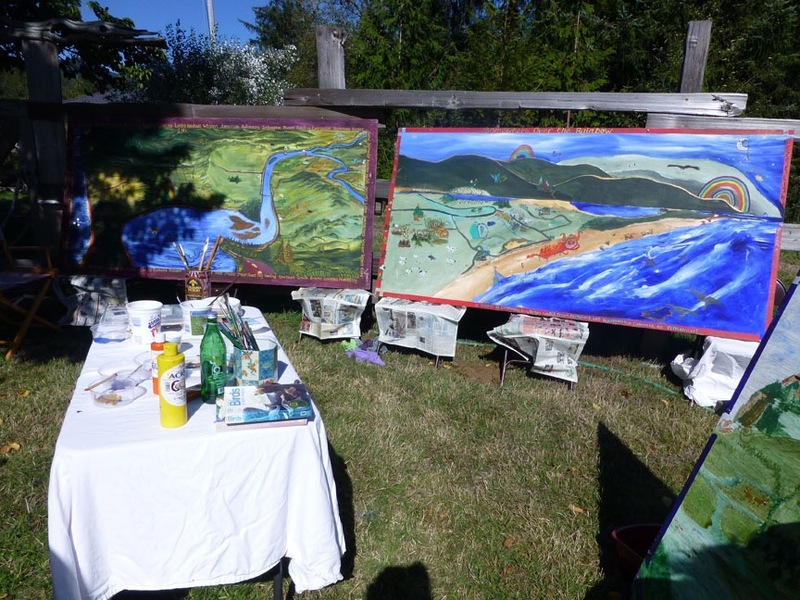 These murals now reside at Lower Nehalem Community Trust’s Alder Creek Farm. I hope to eventually create a page that illuminates the details of these murals – visions of the future of our community by those who live here. In 2015 we revisited these murals, adding new details and manifestation energy. We’ll see what happens next…. An important genesis of of my community work was a small but potent little visionary magazine I worked on in the 1970’s. A group of us – all “editors” and most living in a big house in NW Portland – would take turns “shepherding” issues full of articles and reviews of resources that covered topics such as recycling, solar and wind power, energy conservation, media and communications, neighborhoods & communities and much more. Eventually many other magazines and books took over each of these topics and Rain folk moved on to other things – Tom and I down to the Oregon coast to take the next steps for bringing our visions alive. 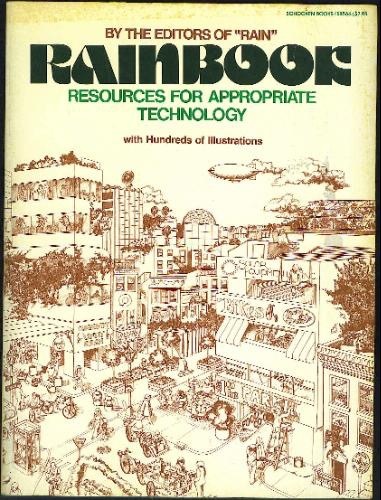 Schocken Books published a compilation called Rainbook and a book of essays called Stepping Stones that can still be found in used book stores and on Amazon. Portland State University recently scanned all the back issues of the magazine – check them out if you want a glimpse “back to the future.” Most of it is still very relevant. Lee Johnson, who was one of the RAIN editors, is working on his memoir of those days called A Fortunate Wind. Lee was our resident “technotwit” and the part he’s written so far is about his adventures finding old Jacobs wind generators in Montana. It’s a work in progress but a fun glimpse into the adventures of those idealistic and formative days.